Beautiful Distressed lettering and a rockin' attitude makes this collector's shirt one to own. With loads of wicked attitude and fun grungy circles and swirls our Fallen Angel Shirt looks terrific anywhere you go. This is a rare offering you can only find here at CuriousInkling.com. Fallen Angel Shirt prints beautifully on either light or dark color shirts. 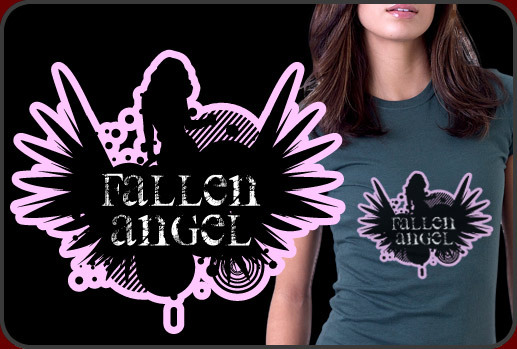 Fallen Angel Shirt design was created in house by one of our award winning graphic artists and you can tell the professionalism in the design. It just oozes confidence and fun. Find great Fallen Angel t-shirts of all sorts of styles and Fallen Angel stickers, mugs, posters and more!